Brendon Abbott, chief designer at Sparkman & Stephens, has partnered with Lyman-Morse Boatbuilding to produce this snazzy 38‘3“ (11.7m) aluminum center-console called the Rambler. A start-up boat company based in Newport, Rhode Island, aims to compete with the growing number of luxury sport boats in the 35‘–65‘ (10.7m–19.8m) range. As examples of this genre, in PBB No. 173 in this column we featured several high-performance, essentially open boats from Dutch builder Vanquish. Like those, the new Rambler 38 features aluminum construction, sunbathing lounge cushions, and carefully concealed belowdeck amenities, i.e., a requisite head and what the late designer Arthur Martin might have called a fornicatorium (see “Energy 48,” on page 10, for more on Arthur Martin). The sustainability claims stem mainly from the choice of materials—that is, 85%-recycled aluminum that can be 100% recycled at end of life. Worry-free finishes mean the CNC-cut aluminum plates come from their supplier either polished, matte, mill spec, coated, or uncoated. Of course, they can be painted as well, or wrapped in vinyl with a choice of graphics. Standard power is twin Mercury 350 (263-kW) outboards, achieving speeds of 45+ mph; with optional quad Mercury 350s it will jump to 60 mph. Yacht designers frequently “test the waters” with new designs, drawn, one suspects, when business is slow. With the Rambler 38, however, Abbott has done more than simply send out drawings to the relevant media; he’s brought in Drew Lyman, president of Lyman-Morse, as a partner in the venture. If they can sell a boat or two, the boats can be built on a jig as one-offs—as nearly all aluminum boats are—without the risk of investing in expensive tooling for fiberglass. A well designed website cements the impression of a going concern. The “Rambler team” displayed a model at last year’s Palm Beach International Boat Show in March. 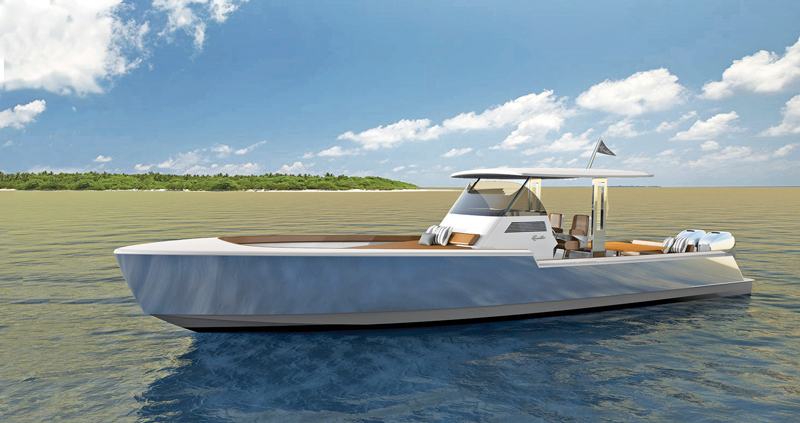 Current plans are to display the first hull at the Fort Lauderdale Boat Show October 31–November 4. The boat looks cool, so let’s hope the prototype hits the water on schedule. Specifications: LOA 38‘3“ (11.7m), beam 11‘10“ (3.6m), draft 2‘1“ (0.64m), deadrise 21°, fuel 450 gal (1,700 l), water 50 gal (200 l). Rambler Yachts, Brendon Abbott, tel. 401–369–0931, website www.rambleryachts.com. Lyman-Morse Boatbuilding, 84 Knox St., Thomaston, ME 04861 USA, tel. 207–354–6904, fax 207–354–8176, website www.lymanmorse.com.